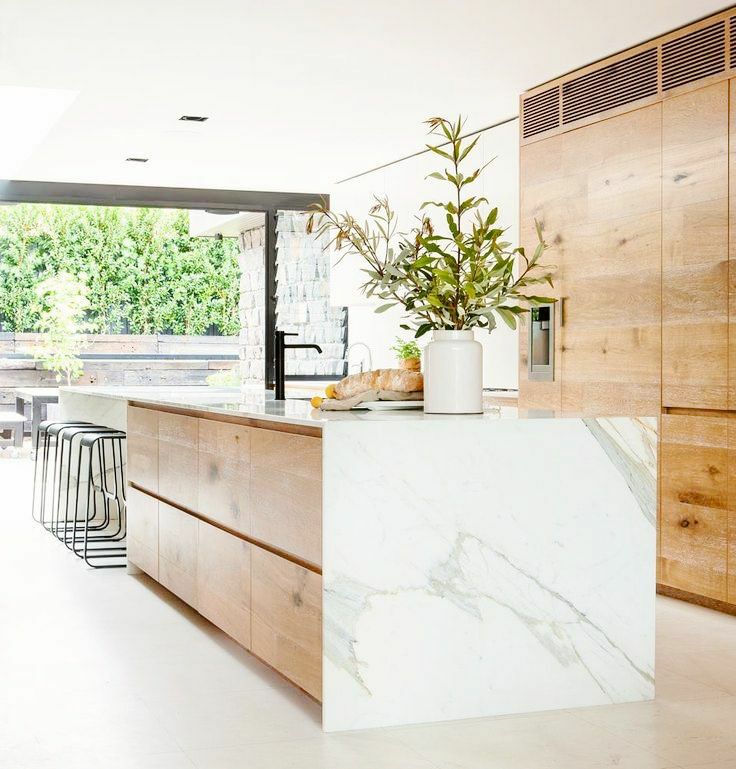 A funny thing happened while everyone was obsessing over white kitchens: Natural wood snuck back in, creating some of the chicest spaces around. For many, natural wood evokes a country feel. Or perhaps something ultra-traditional. But today’s natural wood kitchens are modern showplaces that mimic the newest trends we’ve been seeing in wood floors. You know when you’re watching House Hunters Renovations and the couple looking for a home to buy and redo always has diametrically opposed styles? “I prefer a Craftsman home with lots of architectural detail like molding and built-ins,” says the husband. “I really love the idea of a clean, modern space that’s totally open, almost like a loft, but without the ducting,” says the wife. We could see this stunning kitchen on the show as a beautiful compromise for a couple who wanted some traditional details like the vertical shiplap look on the island and the handles on the drawers, and another who was insistent on commercial appliances (stainless rage and hood), and luxe materials (marble slab counters and backsplash). The wood cabinetry brings it all together. Is that… pine? 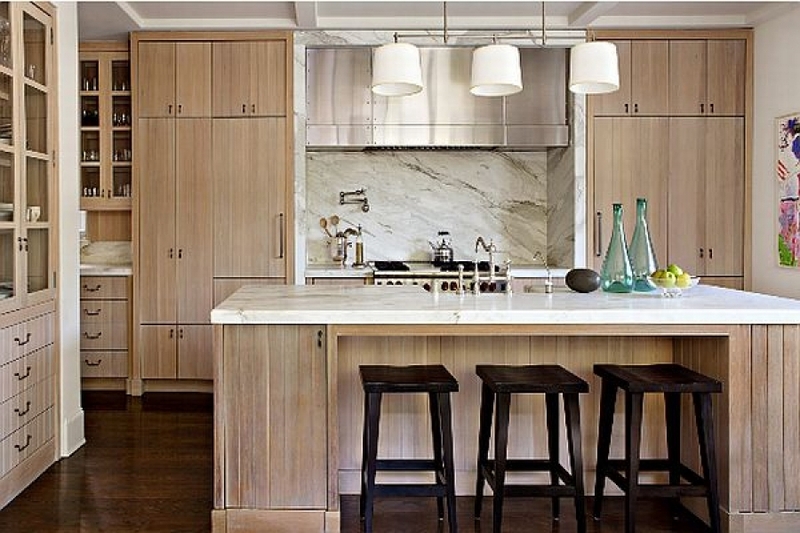 With the right design, any type of natural wood cabinetry can look fresh and new. 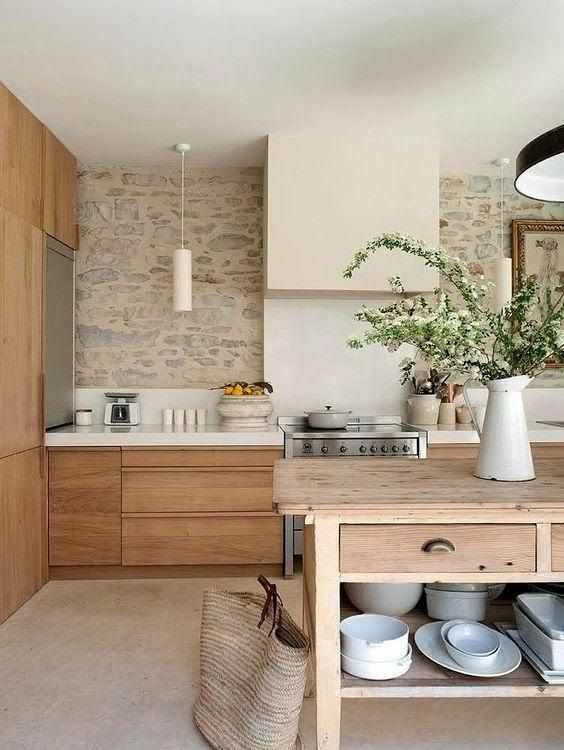 PinterestWith the stone walls, this kitchen could go full Tuscan, or full country French. 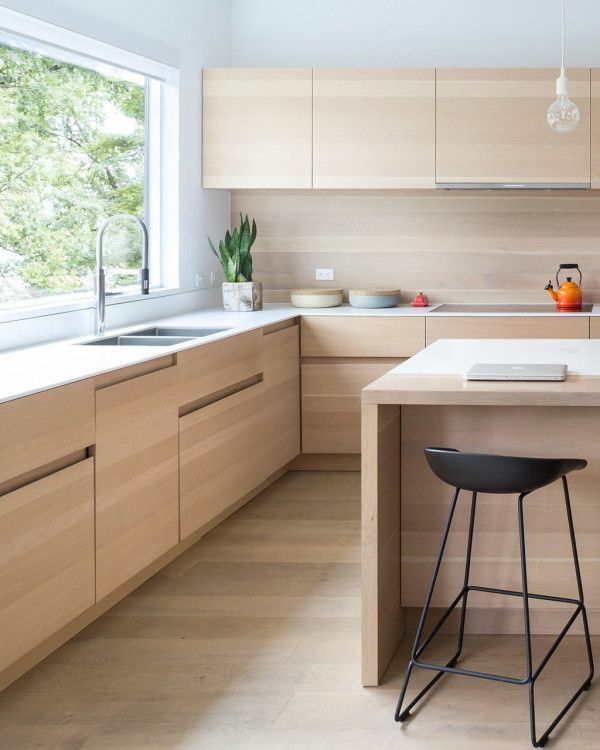 But, the use of materials, with the natural wood, quartz, and stainless steel, and the clean lines everywhere else, keeps the kitchen looking fresh. PinterestFor a minimalist, modern look, why not run the wood right up the backsplash? PinterestThe mismatched look has been hot for some time, and this kitchen shows you how to do it with natural wood. The texture on the bottom cabinets is the perfect way to show them off. apartmenttherapy.comNatural wood in a mid-tone brown is also a great counterpoint to an all-white kitchen if you’re not ready to take the plunge all over. 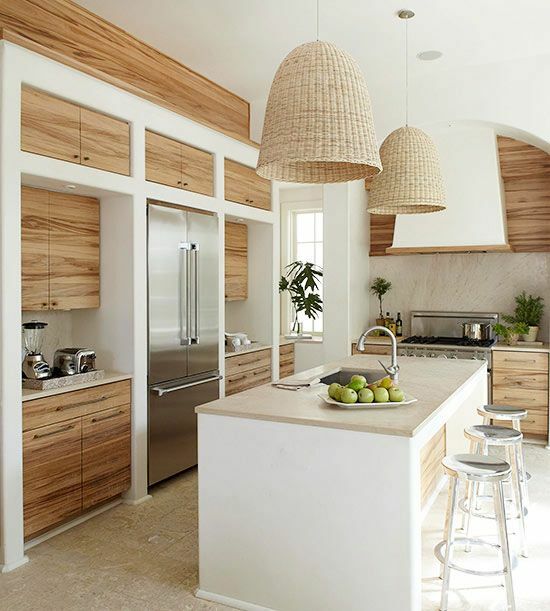 Notice how the island has more traditional lines, juxtaposed against the modern white cabinetry.